Regular fuel sampling and analysis is an essential component of a sound fuel quality maintenance program, which is why it’s one of the core services we provide for our customers. We typically pull fuel samples using a cylindrical stainless-steel device called a Bacon Bomb (or “Fuel Thief”), which we lower into the tank with a cord to take one sample each from the top, middle, and bottom of the tank. (It’s important to note that a fuel sample at the top can look substantially different than the fuel taken from the tank bottom). Often, you can see signs of water or microbial contamination with the naked eye, but not always, which is why an independent laboratory analysis is required. A clean-looking fuel sample does not always tell the full story. 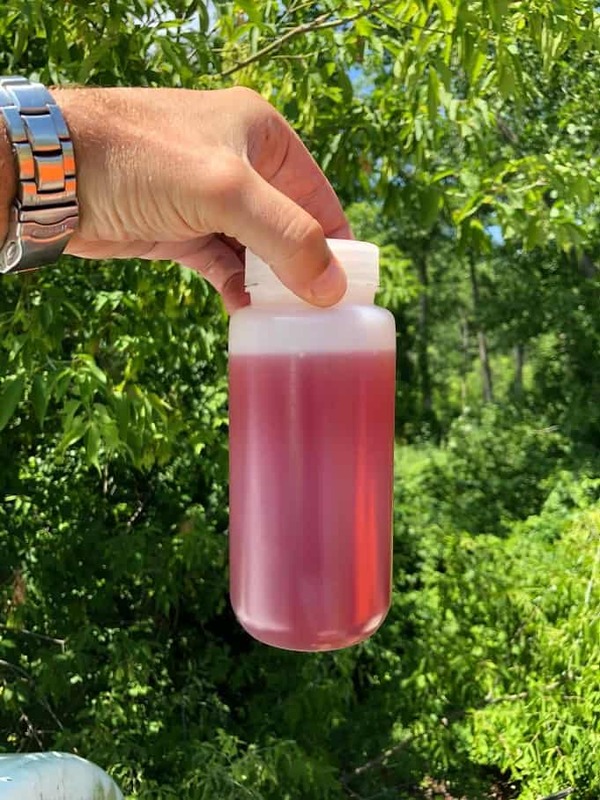 We recently pulled the fuel sample (pictured at right) from a 10,000 gallon off-road diesel fuel tank, which had been in receipt of a delivery shorty before we arrived. You will notice, as our customer did, that the sample itself looks relatively clean. This would be great news if it weren’t for the second picture (scroll to bottom), which shows clear evidence of a problem in the tank. In the second picture, the matter covering the surface of the fuel thief is corroded metal, which we know because it responded to our magnet. Where there is tank corrosion, there is usually microbial contamination, and where there is microbial contamination, there is water. 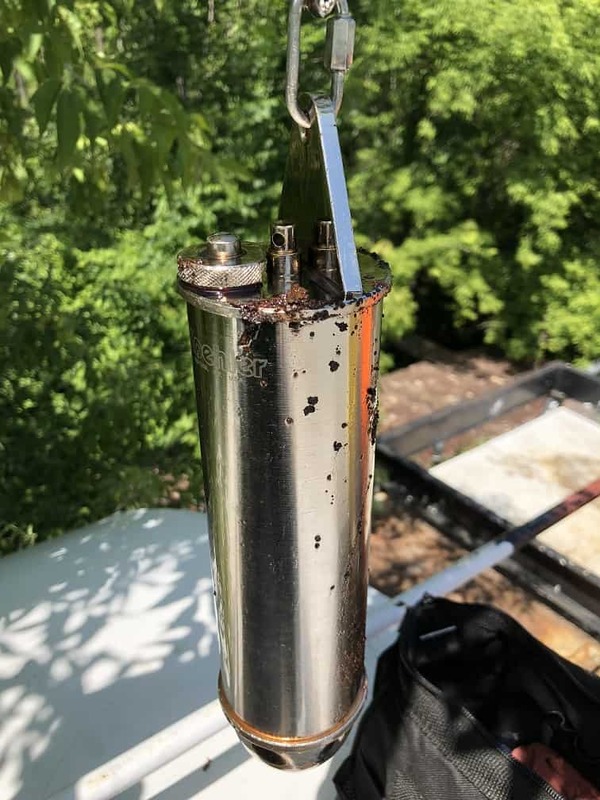 While turbulence in the tank caused by the the recent fuel delivery made the contamination more difficult to capture with the fuel thief, the heavier bits of corroded metal quickly settled to the bottom, where they could be pulled up with the sample. What likely happened is at some point, rain water seeped in through the vent of the tank, humid air carried moisture in during a fuel withdrawal, or our customer was simply on the receiving end of a load of “wet” fuel. However it got there, once in the tank, water promoted air and waterborne microbial life—bacterial cells or fungal spores known in the industry as “bugs”—which live in the water at the bottom of the tank and feed off the hydrocarbons in the fuel at the fuel/water interface. They’ll also consume rubber gaskets, O-rings, hoses, tank linings and coatings in an effort to obtain their mineral content. The waste from this process produces water, sludge, corrosive acids and other harmful byproducts. Under the ideal conditions of a warm day (68-86 degrees Fahrenheit), bacteria can double in population every 20 minutes, forming destructive, gel-like colonies known as biofilms. If not addressed, the proliferation of bugs will clog fuel filters, fuel lines and gauges; corrode pumps, injectors and tank bottoms; cause washers, hoses and connectors to swell and blister; degrade fuel, and cause poor fuel economy. If microbial contamination is detected—either by visual observation of a fuel filter or bottom sample, or by analytical laboratory testing—cleanup can be both difficult and expensive. In all cases, water bottoms should be drained and a biocide should be added to treat the remaining fuel. While in some instances it may only be necessary to filter the treated fuel, more severe cases will require physical removal of floating biofilm or bottom sludge. Depending on the severity of the problem, manual cleaning of the tank may be required before refueling to remove any remaining debris or corrosive byproduct from the interior surface. Good housekeeping is the best and most cost-effective preventative measure against microbial contamination. Water should be drained from storage tanks at least every six months, and especially before the start of winter. If all water can’t be removed, the remaining in-tank water should be treated with a water-soluble biocide—also every six months—or the pH level of the water should be raised to a level that is less conducive to microbial growth (pH 9.0 or higher). Fuel tanks should be kept at or near capacity to minimize contamination due to the condensation of moist air in the tank. Lastly, tank bottoms should be sampled and analyzed every three to four months. Periodic sampling is an essential part of any preventative program. While some level of water will undoubtedly be detected, with a sound maintenance program in place, microbial growth—and corrosion—will not.